Shangqing Ancient Caravan Trail, located in Shaoxing County and also known as Huiji Ancient Caravan Trail, got the name cause it connects Shangkang Village and Qinglian Village. It's the only path connecting Shaoxing County and Shengzhou County in old time. Though there are roads constructed from Shangkang to Suoxiqiao Villange and from Xinlian to Qinglian Village, the part from Suosiqiao Village and Xinlian Village still kept its old style. You can enjoy the beautiful tranquility, lovely old houses, nice reservoirs, awesome bamboo forest and learn their daily life along this 10.8 Km trail. 08:32 – 09:59 board train G7547 for Shaoxing; Arrive at Shaoxing station, picked up by chartered mini van, and transfer to the trail entrance (+/- 1 hr). 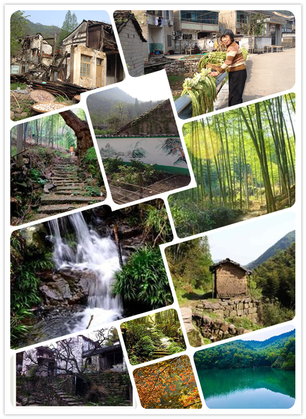 13:30 – Keep hiking along the Shangqing Ancient Caravan Trail, walking past old villages and bamboo forest. 18:28 – 19:52 board train G7588 and return to Shanghai Hongqiao Railway station.